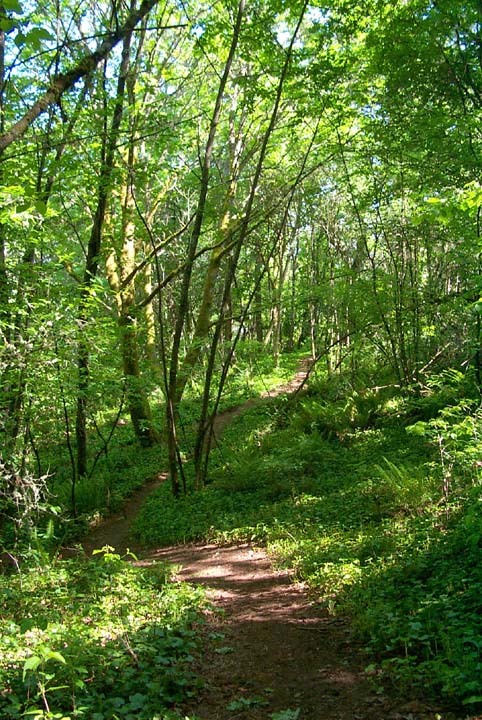 The Audubon Nature Reserve Memorial Park is located in west Salem, OR. This small forest park which is just over 7 acres was donated by the Gehlhar-Schnuelle families in December 1991 in order to protect it from commercial development. 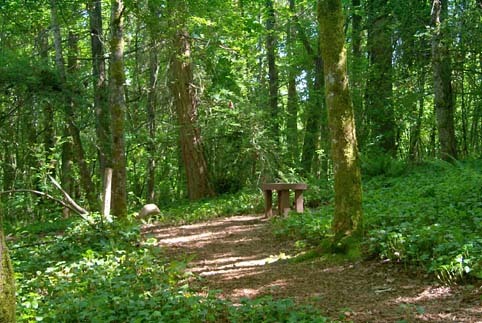 Located along the well prepared trail you will find three sitting benches. One is located at the north end of the park, the second is in the middle and the final bench is located about two-thirds of the way south. The trail forms two loops with a connector trail in the middle of the park. You will find many Big Leaf Maples and White Oaks with a sprinkling of Douglas Fir. The understory is mainly Cherry and Hawthorne with a lone Madrone thrown in for good measure. Much of the forest floor is covered in English Ivy vines which crawls up the trunks of the Big Leaf Maples. Other low growth includes Indian Plum, Slowberry, Himilian Blackberry and a little Poison Oak. In the spring you will see White Fawn Lilies along the trails edge and Trilliums dotting the forest floor. Expect to hear many birds. Robins, Starlings and Swifts are all commonly found. You will need to carry your own water supply and there are not any restroom facilities present. Travel about 1.5 miles and take the “Rosemont / Edgewater” exit. Turn left at the first stoplight (you will see a Safeway shopping center). Travel about 0.25 miles to west edge of Safeway parking lot. Turn right onto Eola Drive. Travel up the hill another short 0.25 miles and you will see the parking lot and sign on your right hand side. Traveling east take the HWY 221 exit. Turn left onto Eola Drive. Thanks to Jerry Smith of the Salem chapter of the Audubon Society for providing many of the facts you have read.